Last May 3, facebook user Soy Gonzales posted on her account a 3 sets of videos where a female student name Joana Balen was yelled and hurt by a man name John Michael Arellano when they were riding on a fx car. Soy started her story when she was on the car, a married couple rode at nova stop. When the door of the car opened, they were shocked when the guy yelled at the female student who was near the door. The guy told the student to move aside and don’t let them make their travel difficult. The student replied that she will go down at the Olympus but the guy angrily answered her that their destination will also be in Olympus. On the second video when the married couple was about to go down, the guy suddenly punched the student. Fortunately, she was just stricken on her shoulder. The guy even use foul words to the student and told her that he had a huge problem. 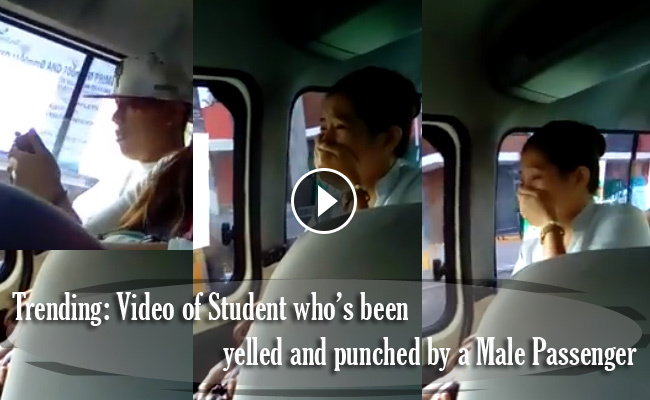 On the third video, you will see that the female student was crying and traumatized on what happened. The uploader tried to comfort her and ask for her name before she go down to the vehicle. At the end of Soy’s post, she gave a shoutout to the guy to never involve other people if he has a problem. She also seek help to netizens to share her story and help Joana. As of this typing, her post was liked by 39,000 facebook users. It also reached 45,000 comments and was shared 135,000 times. The furious netizens search for the guy in the video and bombarded him with their angry comments but the guy was even proud that he is now famous. This made the netizens got more irritated with his boastful personality.